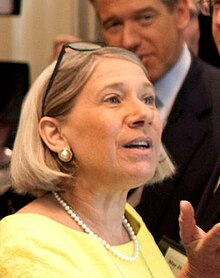 Anita Dunn (born January 8, 1958) is an American political strategist who served as White House Communications Director under President Barack Obama from April through November 2009. She is a senior partner at SKDKnickerbocker, a strategic communications firm in Washington, D.C., and has recently become a contributor for NBC News/MSNBC/CNBC. We're going to treat them [FOX News] the way we would treat an opponent. As they are undertaking a war against Barack Obama and the White House, we don't need to pretend that this is the way that legitimate news organizations behave. What I think is fair to say about Fox — and certainly it’s the way we view it — is that it really is more a wing of the Republican Party. They take their talking points, put them on the air; take their opposition research, put them on the air. And that’s fine. But let’s not pretend they’re a news network the way CNN is. The third lesson and tip actually comes from two of my favorite political philosophers - Mao Tse Tung and Mother Teresa, not often coupled with each other, but the two people that I turn to most to basically deliver a simple point, which is, you're going to make choices. You're going to challenge. You're going to say, "Why not?". You're going to figure out how to do things that have never been done before. But here's the deal: These are your choices, they are no one else's. In 1947, when Mao Zedong was being challenged within his own party on his plan to basically take China over. Chiang Kai-shek and the Nationalist Chinese held the cities, they had the army, they had the air force, they had everything on their side. And people said, "How can you win? How can you do this? How can you do this, against all of the odds against you?" And Mao Zedong said, you know, "You fight your war, and I'll fight mine." And think about that for a second. You don't have to accept the definition of how to do things and you don't have to follow other peoples choices and paths. Ok? It is about your choices and your path. You fight your own war, you lay out your own path, you figure out what's right for you. You don't let external definition define how good you are internally, you fight your war, you let them fight theirs. Everybody has their own path. This page was last edited on 4 February 2018, at 20:31.